These tasty chicken kabobs are baked in the oven, then finished under the broiler. The result: juicy chicken kabobs that everyone will love! You can absolutely make chicken kabobs in the oven. Grilling is the natural method for preparing kabobs. But if you don’t own a grill, or if it happens to be minus 10 degrees outside, you can still enjoy juicy, flavorful and healthy chicken kabobs! How do you cook chicken skewers in the oven? My family loves these oven-baked chicken kabobs. They are delicious and very juicy. I love making them because it’s an easy recipe. Simply cube the chicken, toss in a marinade, thread on skewers, and bake. Finishing them under the broiler is not mandatory, but it does brown them nicely. What marinade to use in these oven chicken kabobs? For the marinade, I usually use olive oil, salt and pepper, garlic powder, onion powder and thyme. It’s a simple flavor combination that works really well with chicken. But you can play with this recipe and use whatever seasonings you like. Chili powder, smoked paprika and oregano will all taste great in this recipe, so don’t be afraid to experiment with your own combination of spices. How to serve oven chicken kabobs? This dish is great with any number of side dishes, but I most often serve it with roasted cherry tomatoes, roasted radishes, or roasted red onions. 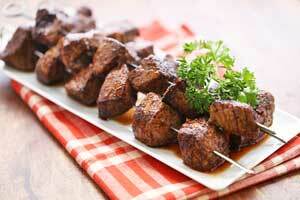 If you like kabobs, you should try this wonderful recipe for beef kabobs. Just like this one, it’s also easy, quick, and healthy. Another good one: oven broiled sausage kabobs. Preheat oven to 450 degrees F. Line a baking sheet with foil. Cut the chicken breasts into cubes as shown in the video. Add to the bowl and toss with the seasoned olive oil. Bake the chicken kabobs for 15 minutes. Switch the oven to broil, place the baking sheet under the broiler, and broil just until browned, about 2 minutes.